Marine mammals and seabirds will continue to use the waters around operational wave and tidal renewable energy devices, finds a report published on Tuesday 13th June 2017 by Scottish Natural Heritage (SNH). A major study of wildlife observations collected over ten years around wave and tidal energy test sites in Orkney has found little evidence of any long-term effects on the use of surrounding seas by the birds and marine mammals living in the area. The coasts and seas around Orkney are renowned for their wildlife, attracting thousands of visitors to the islands each year. Since 2005, a wide range of wave and tidal energy converters have been tested at two test facilities run by the European Marine Energy Centre (EMEC) in Orkney. Throughout this time, detailed observation records have been kept of the birds and marine mammals present offshore - and living in and around the test areas. In 2014, to further improve our understanding of how these new technologies influence marine wildlife, SNH, Marine Scotland and EMEC started a detailed analysis of the vast number of observations collected since 2005. The study investigated how species distribution and density varied across the test sites, relative to different levels of site-testing activity, over the ten-year period. Comparisons were made among the number of animals present before any turbines, or their support structures, were in place; when support structures only were in place; when turbines were in place; and when turbines were in place and operational. Statistical analysis of around 10,000 hours of observations at the Fall of Warness tidal test site off Eday indicated a change in density and redistribution of some bird species when construction work started, The birds affected included the great northern diver, black and common guillemot, cormorants, shags, ducks and geese,. However, in nearly all cases, numbers returned to around previous levels once the tidal turbines were installed and operational. Observations of seals, whales and dolphins revealed similar findings. Scientists believe that the increased boat activity associated with the initial construction of the devices might cause the temporary disturbance and displacement of some species, but numbers recover once this busy phase of activity is complete and the tidal turbines are operational. For some species observed at the sites, the patterns of change found may in fact be due to population-wide variances which are not directly linked to the activities around the test areas. At the Billia Croo wave test site, near Stromness, around 6,500 hours of observations were completed, but no significant changes in distribution or density of birds or mammals around the test facilities were detected. Environment Secretary Roseanna Cunningham said: "I welcome the findings of this report, which shows renewable energy devices operating at the European Marine Energy Centre have had little impact on the rich and diverse range of wildlife found in the waters around Orkney. "This is an important step forward and strengthens our understanding of how marine mammals and seabirds respond to the installation and operation of wave and tidal turbines. "We will continue to work with SNH to understand how this research can benefit the development of a successful and sustainable offshore renewable energy industry, while protecting our precious marine environment and iconic marine species." George Lees, Marine Energy Manager at SNH, said: "These initial results are reassuring and show that the deployment and testing of multiple wave and tidal energy converters in the seas off Orkney over more than a decade has not had a significant impact on the diverse and abundant wildlife living there." Caitlin Long, Consents and Project Officer for EMEC, who conducted the research, said: "This project was set up to assist the industry in developing an understanding of the potential wildlife displacement associated with the deployment of marine energy devices. The culmination of the extensive wildlife observation programme and this statistical analysis project should aid regulators, advisory bodies and developers in assessing the potential environmental effects of deploying such devices in our precious marine environment. "EMEC and our developers strive to gain a greater understanding of the potential interactions between test devices and the environment. This project begins to address one of the key unanswered questions regarding the evidence for, and potential extent of, species disturbance and displacement associated with wave and tidal device deployment. We at EMEC are keen to encourage the industry to build upon this initial work through further collaborative and coordinated research, utilising the facilities at our test sites to learn more about the marine environment which we share with a wonderful array of species in Orkney. We would like to thank the developers that contributed operational data to this project, without whose full cooperation this project would not have been feasible." The development of renewable energy technologies and the surveillance and monitoring work at the EMEC sites are helping to achieve the 2020 Challenge for Biodiversity outcome where ‘Scotland's marine and coastal environments are clean, healthy, safe, productive and biologically diverse, meeting the long-term needs of the people and nature'. 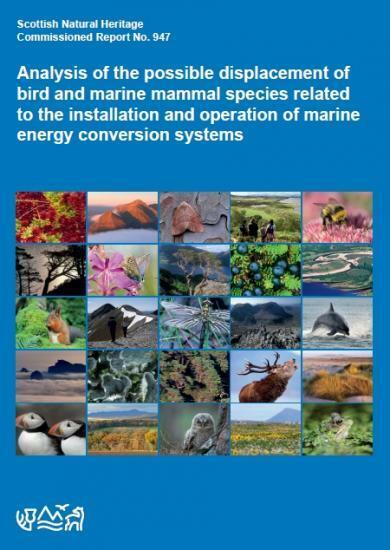 The full report is available on the SNH website - Commissioned Report 947: Analysis of the possible displacement of bird and marine mammal species related to the installation and operation of marine energy conversion systems.